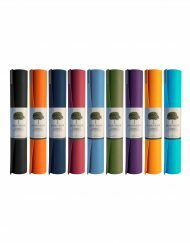 Your yoga mat could be polluting the earth. Be kinder to the environment by switching to PVC-free. The last thing you want to do when you step on your yoga mat is harm the world. 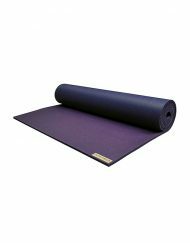 But that’s what many of us do unwittingly each time we roll out conventional yoga mats, many of which contain polyvinyl chloride, or PVC. Like many chemicals, PVC leaves a heavy footprint on the environment. The manufacturing of PVC products releases harmful dioxins into the air and water, and additional dioxins may leech into the soil when the discarded products end up in landfills. Then there are phthalates, used to soften PVCs. Phthalates are added to mats to make them spongy and flexible. These chemicals can wreak havoc on hormones, affecting the count and quality of sperm and increasing the incidence of testicular cancer and genital abnormalities in men and breast cancer in women, according to a study by Greenpeace. Despite these health hazards, there are no government regulations barring or monitoring the use of PVC. Europeans are way ahead of Americans on that: 62 Spanish cities are PVC-free, toys made with the substance are banned in several European countries, and medical products containing PVC are off-limits in some hospitals as well. Fortunately, things are starting to change here too, and there are now several alternative sticky mats on the market. 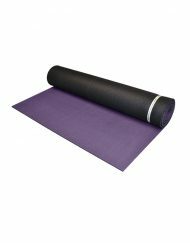 JadeYoga (www.jadeyoga.com) has created two varieties of non-PVC mats, both made of natural rubber. 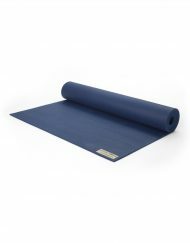 Health & Yoga (www.healthandyoga.com) makes a grass mat with latex backing. 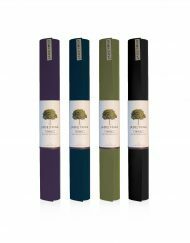 Scotland-based EcoYoga (www.ecoyoga.co.uk), which manufactures their mats in the U.K. to avoid employing child labor, makes mats out of natural rubber and jute—you can even compost them when they become too old to use. Once you’re ready to make the switch, think of ways to reuse your old mat instead of sending it to a landfill. Place it under a rug to prevent slipping or put it out front as a doormat—get creative!